Apart from Penang, Ipoh is a city in Perak, Malaysia that is well-known for its Street-Art or Mural Art. If you feel like locating each of that mural, you need to know that there are two kinds of Mural; one is by Ernest Zacharevic and bunch of new paintings that were created by other artists. The recent Ipoh Mural Art Trail Map produced by Ipoh Tourist Information Center (ITIC) concentrates on Zacharevic’s work. Do note that other paintings (non Zacharevic’s) are located either in the Old Town or New Town. This article is about the paintings that we’ve discovered in the Old Town side. Should you need to have a look at Mural’s Art Lane in Ipoh New Town, check out this post by Rick from iPackTravel (Click HERE). Given that some paintings are well-hidden in the small alleys of Ipoh’s Old Town, one need to be mentally and physically ready to search high and low for all the listed murals. Having been exposed to the elements, some paintings are already showing defects. One particular mural by Ernest Zacharevic is now forever gone, removed by the owner of the building. We both didn’t get the chance to see that mural (obviously!). Here it is, and in case you are looking for it on any walls of Ipoh’s Old Town, save your time and energy. It’s no longer there. Read the article titled as ‘Street Artist accepts removal of mural in Ipoh’-written by Loghun Kumaran of The Malay Mail Online (Link). Colors faded away and some buildings need to be restored, be it for the interior or exterior. 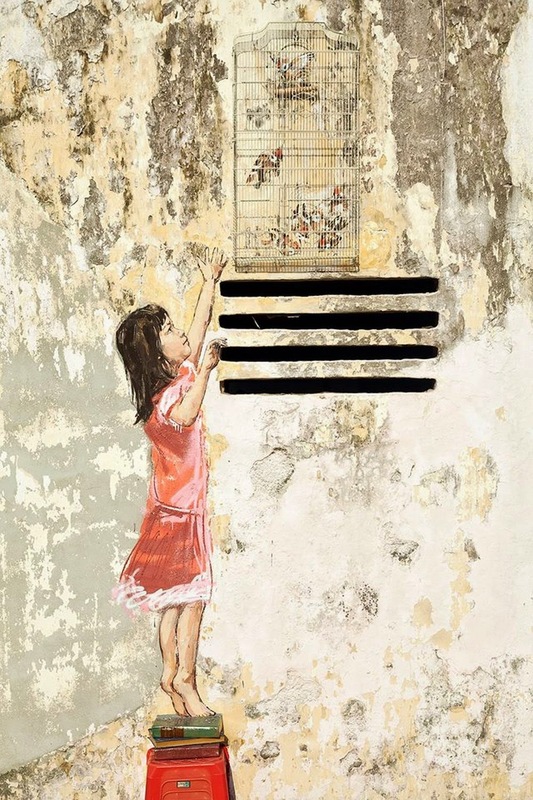 While Ernest Zacharevic was amazingly pleased to have his creations on the walls of some Ipoh’s buildings, there’s no actual agreement to ensure owners keeping the mural forever. It will be ‘erased’ when the time comes. Sadly to say, all Zacharevic’s paintings are becoming extremely expose to the weather thus each of em’ does not look so good in comparison to their state in 2014. #1-Old Uncle with Coffee Cup. While wandering the streets and alleys of Ipoh’s Old Town, we found some interesting murals. There are actually more murals than what we have inserted below. We leave some for you to find, do it when you visit Ipoh! While some paintings are in good condition, some are already faded and in need of ‘restoration’. Ipoh is already one unique city, especially it’s Old Town and we just love spending time here, savoring their best dishes and admiring the murals. It will be a sad thing if Ipoh City Council do not do something to restore those amazing murals. The murals in Ipoh’s Old Town depicts the souls of locals, historically speaking. It truly shows their heritage and culture. It is for this particular reason that something need to be done to put all the murals back to its heyday. Visitors are very much attracted to Ipoh’s Heritage Building, Murals and Foods! These are the reason why people come here. They talked about that all the time, exchanging their views, sharing experiences. Ipoh Heritage Buildings complemented the murals. Both are significant features of Ipoh City, apart from those delicious local dishes. The murals are not just artistically beautiful but educating as well as each of those murals ably to give an idea to visitors in regard to Ipoh’s history and culture. It is therefore important to ensure each mural is in good condition. Well, well, some people are just too creative aren’t they? There are few ‘paintings’ made by some ‘talented’ artist, as shown below. This article is part 3 of 6 that documented our thoughts and experiences during our travel to Ipoh, Perak @ Malaysia.